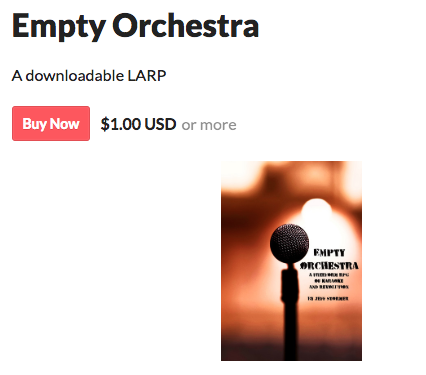 Empty Orchestra is a freeform LARP (Live Action Role Play) for two or more people, designed to be played over the course of a night of bar karaoke, created by Jeff Stormer. This project is a redesign of a previous work. The goal was to create a more dynamically visual work that retained the original’s thematic elements. This was accomplished by being inspired by the color and lighting of the original cover, then applying that inspiration to more dynamic stock photography. After that it was a matter of altering the photos to give a strong pop art vibe and reestablishing light elements in the form of bokeh patterns.